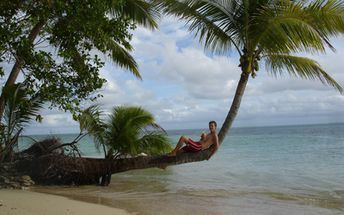 This beach ranks #5 of the "Best beaches in Fiji"
Leleuvia Island Resot is a best value for money hotel. There is a 16-bed dormitory, 2-person bures, as well as double bungalows, suitable for families with children. Attention! Some booking systems show wrong location of the hotel - on the big island of Viti Levu. In reality, the hotel is located exactly where it should be - on a small idyllic Leleuvia island. Fly to Nadi International Airport (NAN). Next take a ferry or take a domestic flight to Ovalau island. See here for more details. Next take a boat. You may also take a boat to Leleuvia island directly from the main island of Viti Levu (from pier Waidalice Landing or from port of Bau Landing, $50 for the return trip). Transfer can be arranged through the hotel or from Ovalau Watersports company. It is necessary to call in advance to give the boat your pick up time from the pier. The best time to travel to Lomaiviti islands is a dry season from May to November. The rainy season has also many sunny days. However, you should understand that in the rain it's nothing to do on that small islands.